Rancho La Quinta is an exquisite active lifestyle community in the Palm Springs, California area. Inside the gates of this exclusive country club, you'll find both tranquility and activity. Residents enjoy a graceful and carefree lifestyle with luxurious club amenities, manicured grounds and two spectacular golf courses with breathtaking views of the Santa Rosa Mountains. Established in 1993, Rancho La Quinta features 960 well-crafted single-family and attached homes. Its close proximity to Palm Springs provides residents with endless options for dining, shopping and recreational fun. Rancho La Quinta has an impressive 23,000 square-foot clubhouse that is the central point for dining and entertainment. Dining options range from an intimate dinner for two or parties up to 600 guests including the main dining room, private dining room and the popular restaurant The Turn. The clubhouse also includes a fully stocked pro shop and locker rooms. The Racquet Club is a 7,000 square-foot facility that is perfect for keeping up with personal well-being. The Racquet Club features a tennis pro shop, locker rooms and a fitness center with state-of-the-art exercise equipment. After a workout, residents can grab a bite to eat at The Cantina. Outside, the patio dining and the junior Olympic-size pool with lap lanes are all great places to gather with friends. Here, residents can enjoy nine lighted tennis courts. Two of the courts are clay, and there is also a court that has stadium seating. The two golf courses at Rancho La Quinta are The Jones and The Pate. Renowned architect Robert Trent Jones Jr. designed the 18-hole Jones course that features 7,100 yards of challenging and exciting golf. The par-72 Pate course is sure to capture the heart and soul of every golfer with 18 holes of strategically placed water throughout the course. Within the gates of Rancho La Quinta there are over 20 single-family and attached floor plans. The single-family homes feature two to four bedrooms and two to four-and-a-half bathrooms. These homes were designed to have open living spaces with most featuring a den and an attached two to three-car garage. The attached homes range in size from 1,550 to 2,078 square feet and offer two or three bedrooms, two to three bathrooms and an attached two-car garage. Some homes also provide residents with mission-style architecture and private pools and patios. T.D. Desert Development built Rancho La Quinta between 1993 and 2009. There are no longer new construction homes available but there are available resale homes on the market. Residents pay a reasonable monthly homeowners association fee that goes towards the maintenance of the amenities including both golf courses. With the variety of choices, there is a price, size and style that suits almost any buyer. Homeowners of Rancho La Quinta buy more than a home, they buy a way of life. Here, residents will find an active lifestyle that starts with quality homes that allow carefree living with world-class amenities. Residents stay active by playing tennis or one of several golf tournaments. Socializing is easy with residents planning Fabulous Friday, cocktail parties and holiday parties. Rancho La Quinta is a fun and welcoming community with superior location, a connected community, and an amazing lifestyle. Rancho La Quinta is located at the corner of Eisenhower Drive and Washington Street on Rancho La Quinta Drive. It is in the heart of La Quinta, California and is in close proximity to Highway 111 and Interstate 10. In addition to outstanding dining at the club, there are various fine and casual restaurants around the corner. Old Town La Quinta is just minutes away and is filled with boutiques and popular restaurants. It is also 10 minutes from shopping at El Paseo in Palm Desert and the McCallum Theatre. Rancho La Quinta is only 18 miles from the Palm Springs International Airport and is just a two-hour drive from many Southern California beaches. Residents around Palm Springs, California who desire country club living in the heart of the Coachella Valley should look no further than Rancho La Quinta. 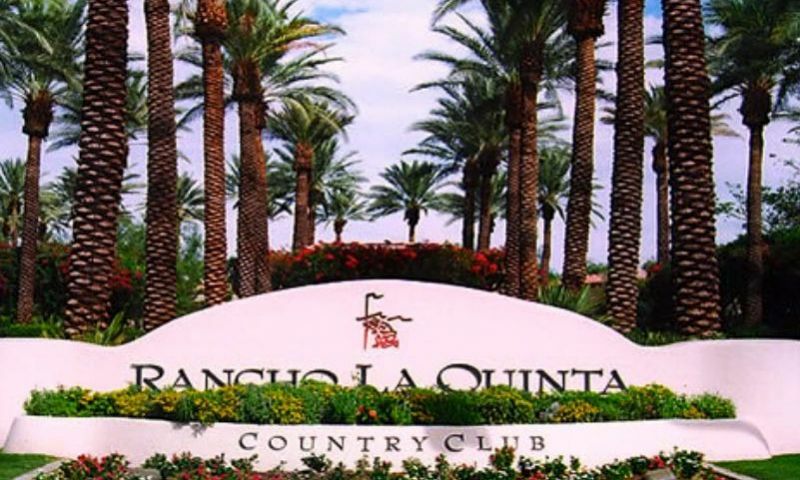 Rancho La Quinta Country Club is a 23,000 square-foot clubhouse that is the central point for dining, entertainment and social activity with friends. Clubhouse - 23,000 Sq. Ft. The Racquet Club is a 7,000 square-foot clubhouse that offers additional amenities for an active lifestyle. Racquet Club - 7,000 Sq. Ft. There are plenty of activities available in Rancho La Quinta. Here is a sample of some of the clubs, activities and classes offered here. Rancho La Quinta has luxury townhomes that surround the Racquet Club. There are four floor plans that range from 1,550 to 2,078 square feet. All are homes have two or three bedrooms, two to three bathrooms and an attached two-car garage. These homes were designed to have open living spaces with most featuring a den and an attached two-car garage. The Off Fairway homes offer residents a more reasonably priced option while still enjoying all of the benefits of Rancho La Quinta. These single-family homes range in size from 2,038 to over 2,500 square feet and offer two or three bedrooms, two to three-and-a-half bathrooms and an attached two to three-car garage. Within the Fairway ollection of Rancho La Quinta there are over ten floor plans that range from 2,403 to 4,243 square feet. All are single-family homes that range from at least two bedrooms and two bathrooms up to four bedrooms and four bathrooms. These homes were designed to have open living spaces with most featuring a den and an attached two-car garage. Beautiful community in La Quinta. Fabulous golf and amenities! 55places.com is not affiliated with the developer(s) or homeowners association of Rancho La Quinta. The information you submit is distributed to a 55places.com Partner Agent, who is a licensed real estate agent. The information regarding Rancho La Quinta has not been verified or approved by the developer or homeowners association. Please verify all information prior to purchasing. 55places.com is not responsible for any errors regarding the information displayed on this website.